This extensively updated text fully equips today’s occupational and physical therapists with indispensable knowledge about rapidly-evolving policy developments that are reshaping their professions. Health Services, Third Edition reflects PPACA (US health care reform); major changes to Medicare and reimbursement policies, and other key trends that are impacting practitioners or soon will. 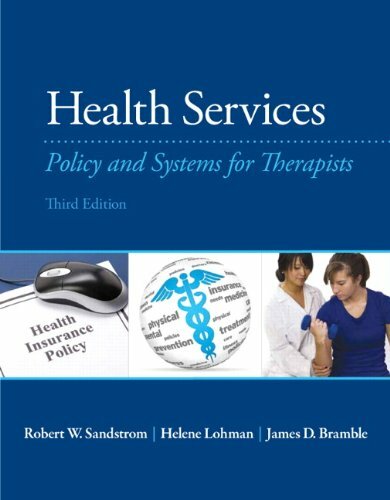 Health Services, Third Edition explains the principles and major structures of health services; reviews how policies and systems affect therapists’ ability to serve patients, and shows how to be an effective advocate for both private and public policy change. The authors explore access, cost, quality, licensure, informed consent, medical liability, and many other key issues. A new chapter on global and population health integrates important public health topics, and substantial new content is provided on special education and mental health care systems.